You can attach a single event handler (method) to more than one event, originating from more than one object. 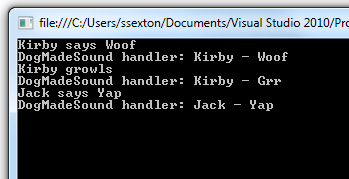 In the example below, we have a general DogMadeSound handler that we attach to the Barked and Growled events of one Dog instance (Kirby) and to the Barked event of another Dog (Jack). When any of these events fire, our handler will get called.